Just when I thought I’d pinned down the overall vibe of Daddy Tank Records, this punishing cassette plops into my lap (or, at least, a digital copy – the actual cassette should land in the post next week, I hope). Fans of the Melvins, other sludge behemoths, and oppressive noise in general, roll up for Pure Will – it’s only four tracks, but still plows through over half an hour of raw, abrasive, ear-crushing savagery. The lyrics, shouted in grating, furious spurts, are indecipherable, and ergo irrelevant. Now, for much of the EP, Backwards lash out with unrelenting, slow-burning rage. The opener, “Bowed”, however, stalks onward in a perpetual crawl, smothering the listener slowly to death with one balls-out bass line and bellowed, stretched-out vocals. Above this, moaning guitars waft about like a swarm of flies over carrion, descending at around 7’49” for a languid, unsettling solo. “Junky’s Kiss”, on the other hand, is far more dynamic – after its frantic, desperate death throes, the track dies prematurely, then rises from the grave with a skin-crawling, bass-heavy sulk and pins you down against the cold dirt ground. Side B is no less brutal than its predecessor, but this time throws a squealing, anarchic sax into the mix. “Matador”, which features some relatively dexterous drums, is studded with freaked-out moments of lunacy from the brassy instrument. Near the midway point of the track, the vocalist and the saxophonist lock themselves in mortal combat; the latter combatant, clearly overwhelmed by the indomitable pipes of the former, chooses instead to run madly around the room, seeking desperately for an escape route and finding none. The closer, though, is inevitably my favorite. And it’s a mouthful, too – “Quick Me The Grease Of The Knife”. What knife, you ask? Why, the one that Backwards are about to slaughter you with, of course. This time, the killer riff advances in an even, steady pace – a groove, one could even say - and the saxophonist charges into the bloody fray like he owns this number. And the raging vocalist actually flows with the groove this time, and it gels gloriously. The intensity thickens at 5’06” with a hastened, beefier beat, which plows on until another INSANE sax solo infiltrates the track and decimates all who oppose it. To conclude – for everyone who’s ready to assassinate the sleek and dreamy poster boys of today’s musical soundscape, this one’s for you. Loud, nasty, and evil to the core, Backwards will seize you in a chokehold and slowly (but surely) wrench the last breath from your pathetic body. And pain is good for you, kids. 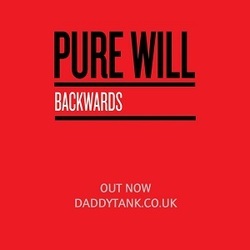 Hear "Quick Me" and buy the cassette here from Daddy Tank’s website.